We stream a lot of content at our house. Whether we are watching a live homeschool class, enjoying weekend movies from our favorite content provider, or looking at funny YouTube videos, there is usually an issue with which device we can watch it on. You see, while we have all kinds of devices in our house (tablets, phones, flat screens, and desktops), there always seems to be an issue with how to get the content we found to the place where everyone can see it at once. That's why it has been fun to try out two new products from ActionTec: The MyWirelessTV 2 & ScreenBeam Mini2. The point of the device, however, is to free you from having to hard-wire monitors or TV's to the devices that run your content. For example, if you had a cable box in one room, and want to watch a show in another room, you could move the cable box, string a long cord from one room to the other, -- or you could use the MyWirelessTV 2 to transmit the show without wires to the TV in the other room. 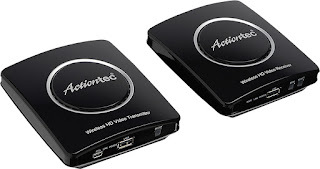 We used this device by first connecting my streaming media device to the ActionTech Wireless HD Video Transmitter. I could use my existing HDMI cable, or the one provided. I can also choose to connect it to the TV in the family room that it is in. Then, I connect the TV in the boy's bedroom to the Wireless HD Video Receiver. Now, the transmitter and the receiver communicate with each other. Anything I watch on the family room TV can also be viewed on the 2nd, even though it isn't connected directly to the streaming content box. You can do the same thing with an Xbox, cable box, DVD or Blu-Ray player, or any other streaming device that has an HDMI cable hookup. You can also leave the TV in the first room OFF, and simply use the streaming device to send a signal. We do this sometimes when we want to use the TV in the boys' bedroom and not the one in the family room. Ways that I can see using this include when the boys want to watch a Blu-Ray in their room, but we don't want to have to disconnect the Blu-Ray player from the Family Room TV and move it. Now, we can just connect the Blu-Ray player to the MyWirelessTV transmitter, and the boys can watch it on their TV seamslessly! Best of all, the devices are small and set next to the TV, without much room taken up. 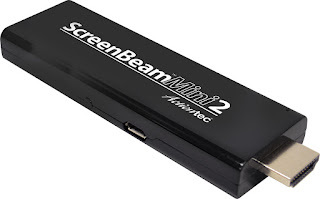 We also had the chance to try the ScreenBeam Mini2. This wireless display for travelers is something we've been getting a lot of use out of. You can use it to mirror anything on your mobile phone, tablet, or laptop to your TV! It's really cool. When we find a video on YouTube that we want to share with the whole family, we just use the ScreenBeam Mini 2 to send it! We've also used it to let the kids watch their brother play online games from the desktop -- as it shows up on our big screen TV! (Note, there is a tiny, half-second delay, so keep this in mind if you want to use it to game.) I also use it to display homeschool lessons to all the kids from my phone. I recommend both for "connected" families that are a bit tired of wires.